United Cutlery Magnesium Flint Fire Striker | BUDK.com - Knives & Swords At The Lowest Prices! 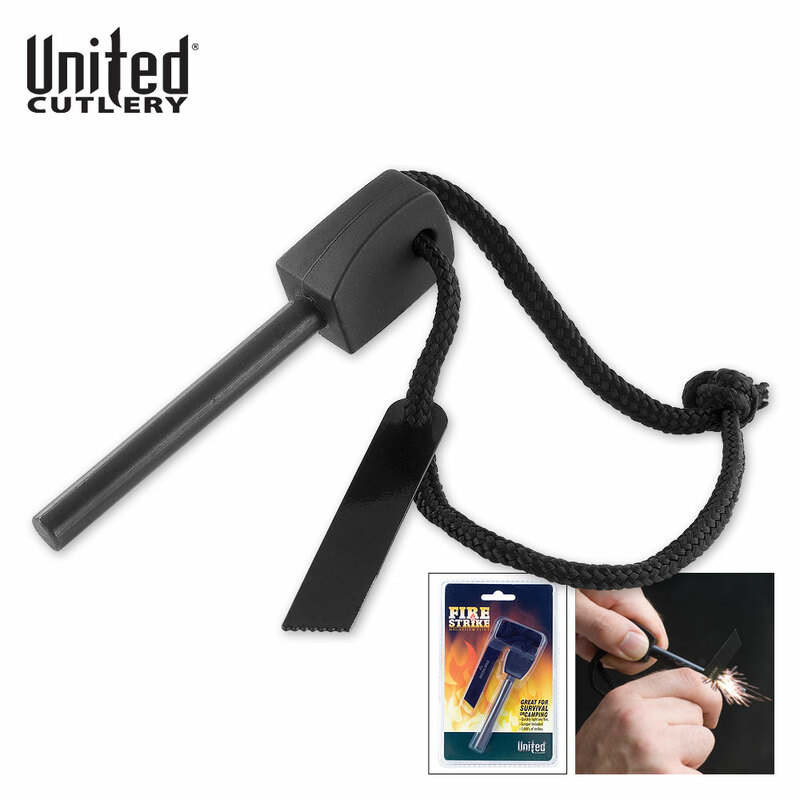 Fire striker measures 2 1/2"
This Magnesium Flint Fire Striker is great for survival or camping! The 4" ferro rod can easily be struck with the attached 2 1/2" fire striker. It quickly and easily lights any fire! These are pretty cool just scrape off the black coat,had a fire with 2nd strike.?? I ordered this fire starter to add to my back pack when I ride my bike. When we stop to bed down for the night I have a quick way to start a fire. Works really good and is compact. Good product. This is comparable to other products on the market but at a reduced price. I purchased two of them thinking that because of the low price, I may have to put more effort and therefore more product into creating fire. I was wrong. I have purchased other brands for more money and attempted to use their striker to no avail. 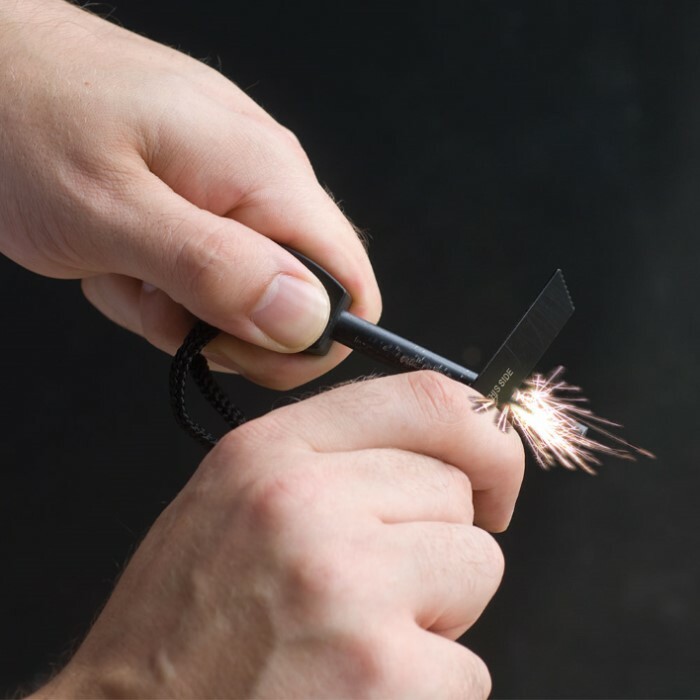 This product creates huge (literally huge) sparks using the striker included. Yes, I was surprised, but happily so. It performed extremely well on tinder bundles, easily ignited them (again using included striker!) Drop on the the kindling and you will have a fire in no time. Got this on sale and for the price its a really good deal. Nice small item to add to the camping gear. I had purchased one these before and liked it so I purchased more it works well and could get you out of a jam in time of need. I was a bit worried that this might be a waste of money, but when it arrived I was very pleased. It is very easy to use and very durable. Thanks BUDK! I bought two of these fire strikers. They should last a very long time: No expiration date to worry about. Everyone should have at least one for emergencies. 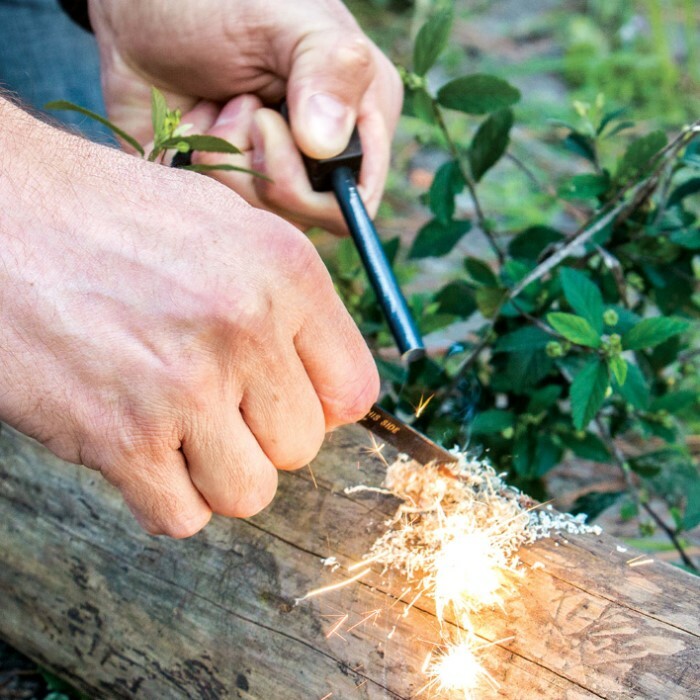 When your Zippo runs out of fluid and your matches got soaked crossing that mountain stream then just pull out this United Cutlery fire starter from you back pack. Daniel Boone would have loved this item hiking through the Appellation Mountains. It is much larger than I thought it would be and should last for many winter camp fires. I am ordering a couple more, one for my first aid kit and a another one for my day pack. This is not a cheap imitation and will work when you need it most. Happy trails.